The second wave of first day back to school pictures have been hitting my social media feeds all week, so I guess that means summer break is officially over. Allison has been back for almost a month now, and while she leaves the house a little after 8am, because of her after school programs I don't see her again until almost 7pm every day. Since she's gone for so long, it's very important that she's eating a filling breakfast before leaving the house, in addition to packing a nutritious lunch and after school snack so she's not starving all day. I don't like for her to fill up on sugary cereal or toaster pastries (though she will settle for those things occasionally), so I keep huge containers of yogurt and fruits on hand for a sweet breakfast without the addition of refined sugars. 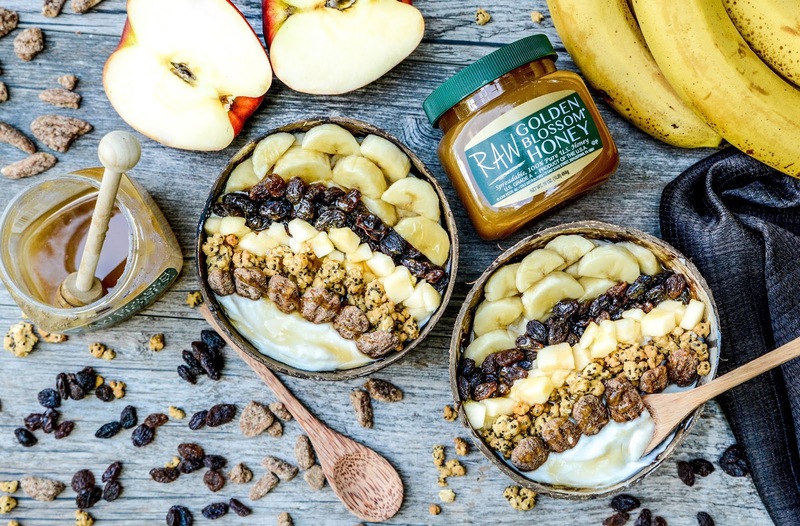 This simple Honey of a Breakfast from Golden Blossom Honey is packed with nutrition and sweetened by nature's candy, it's one that we've turned to several times already this school year. 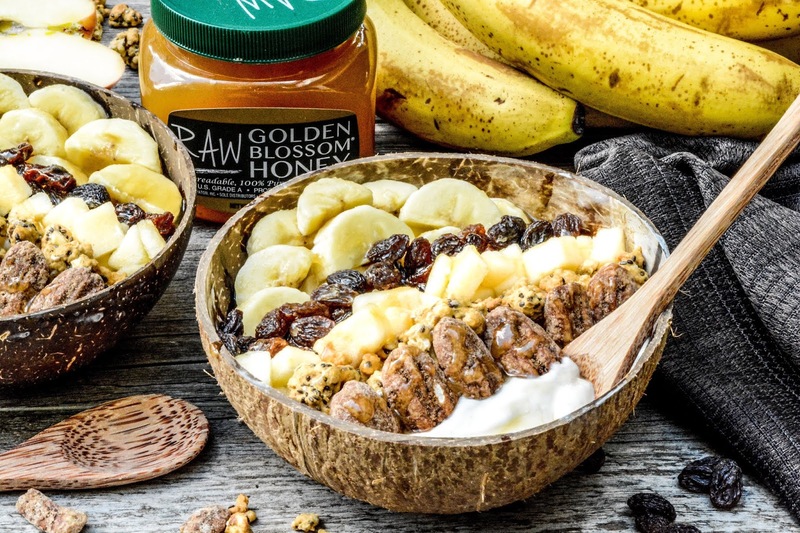 This fruit and yogurt bowl is so simple to toss together, and you can shake things up by switching up the fruits or types of nuts you use from day to day to keep the recipe feeling fresh. This can even be made the night before (just soak your fruits in a little lemon juice to prevent browning) so you can grab and eat without any fuss in the morning. What are your favorite yogurt mix-ins? You did such lovely photos, deary! Are those real bowls or just coconut shells? Thanks, dahlink. They are real bowls made out of coconut shells. Bought them on Amazon and they came with the bamboo spoons too. Just by hand with soap and water. The husk stuff doesn't come off and the insides are smoothed and glazed. I probably wouldn't put them in the dishwasher though. Excuse me while I say, YUM!! That's exactly what I want for breakfast right now. Today I settled for just a banana. Doesn't even compare to what you've got going on here!! Have a lovely weekend! Some days I have to settle for a banana too, but most days it's oatmeal. I hope you have a wonderful weekend, Rosey! Mica and I would gobble this up! It looks so good. Isaak and Travis usually pick to eat cottage cheese. I think Isaak may like this because there's other things in it. Usually I just have plain Greek yogurt with granola and crasins. This looks better! I haven't had cottage cheese in ages. I know my mom likes those cottage cheese cups that have the fruit on the side that you mix in from the grocers. Probably much easier and cheaper to do it yourself though. That looks pretty good but it would have to be a flavored yogurt since I don't like plain yogurt. I would try this with plain yogurt, even though I've never cared for plain. This looks like a great breakfast idea! I love your recipes so much, but even more than that, I love your photography. It makes me so hungry. I love fresh honey! We just bought some from our local Apple Orchard and it tastes amazing!!! These look absolutely delicious. What a perfect breakfast for the back to school season. Now this looks like the perfect way to start with a back to school breakfast! Delicious - I hands up love a good honey! Looks like it will do the trick. Wow, she is sure gone long. Those bowls are neat too. That's awesome! It's important that we serve the kids healthier breakfast dishes. This one's something we'll all enjoy at home. Thanks for the recipe! Healthy and delicious is what breakfasts should be. Thank you for the back to school breakfast recipe idea. This is surely going to power up any one's day! This breakfast sounds like it would be absolutely amazing. I am not a huge person for eating early in the morning but I could totally do this. This breakfast looks and sounds wonderful. If someone set this down in front of me I would eat ever bite of it. You have made your breakfast beautiful! Too beautiful to eat, Theresa :). I have been using honey a lot on my tea and my face! great mask indeed..